Your kids are the most important people in the world to you, and the Internet is a scary place that requires constant vigilance. Luckily, you can set up a child’s account in Windows 10 to make your job as a parent that much easier. We’ve talked about child’s accounts in Windows previously. Microsoft introduced the concept in Windows 8, which takes a standard user account, protects it with Microsoft Family Safety, and integrates it into the operating system. It’s pretty easy to set one up and you can quickly create accounts for you kids, and then protect and monitor their activity in just a few minutes. 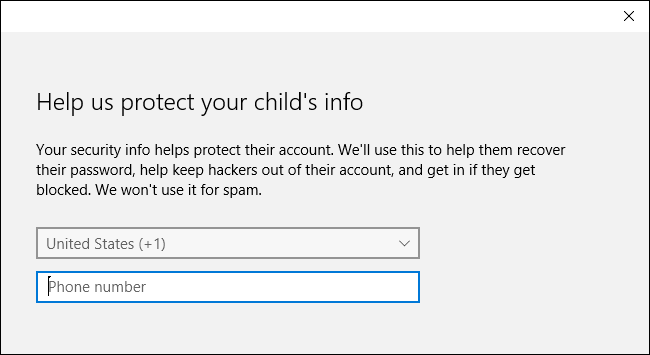 Today, we want to show you how to set up child’s accounts on Windows 10 and reintroduce you briefly to Microsoft Family Safety. 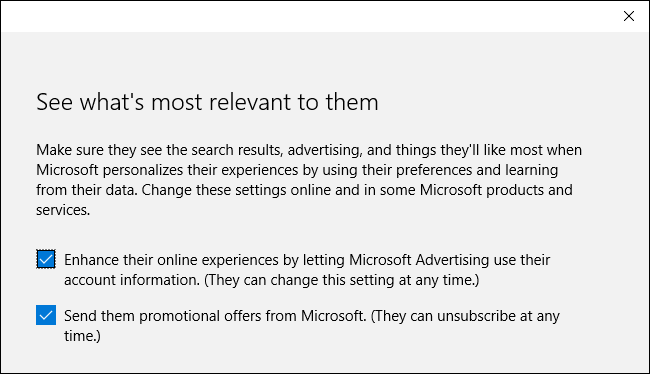 Setting up user accounts on Windows 10 isn’t drastically different, but as we explained recently, it is different from how it’s done in Windows 8.1. In Windows 10, you will want to open up the Settings, then Accounts, and click on “Family & other users”, then click “Add a family member”. On the next screen, click “Add a child”. It’s a good idea that each member of your family, including children, have their own account. Next, you will fill in all the pertinent information needed to set up your child’s account. If they do not have an email account, you can set up an outlook.com account for them. In order to better protect your child’s account’s security, you will need to enter a telephone number. This way if you’re ever unable to access the account, such as if it is hacked or you forget the password, you can have a code sent to your phone that will let you reset it. On the next screen, we uncheck these boxes. It’s entirely up to you, but considering this is a child’s account, we don’t feel either of these options are particularly relevant. 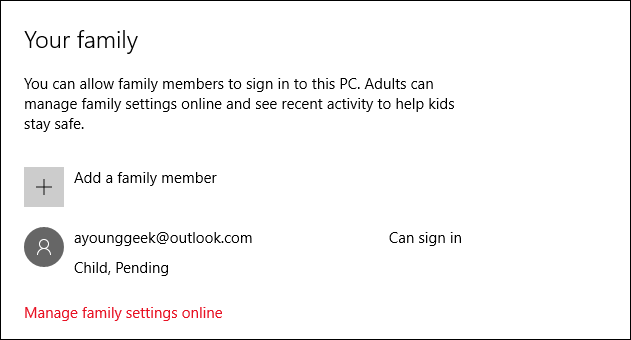 That’s it, your child can now log into their account for the first time, and you can set up and configure their account settings using the Microsoft Family Safety tools online. 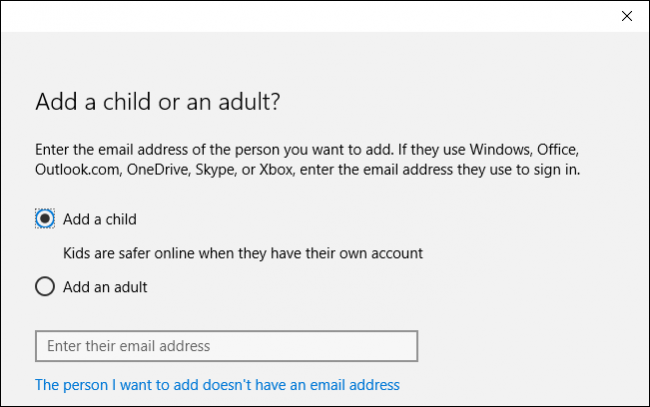 Alternatively, if you have already established an account for your child and you’re simply adding it to your Windows 10 installation, you will need to make sure to confirm their account before any existing family settings can be applied to their account. Until you do so, you will see that their account is still pending. They will be able to sign in and use the computer, but they won’t have the protections you have established, so make sure to confirm their account using the email address you signed them up with. With your child’s account added, you’re ready to head to the Family Safety website. Click “Manage family settings online” to open a browser and head there now. Once you’ve added your child’s account, you can manage those family safety settings from the Family Safety website. The recent activity settings will collect your child’s activity and email reports to you, both of which you can disable. The first item you will want to consider is the “web browsing” category. 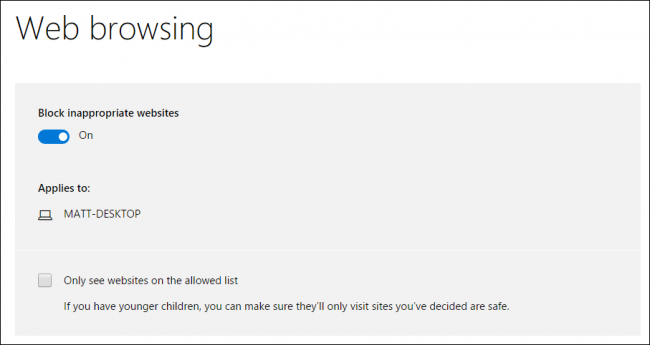 You can “block inappropriate websites” and there is a check box to constrain your child’s web browsing to only websites on the allowed list. 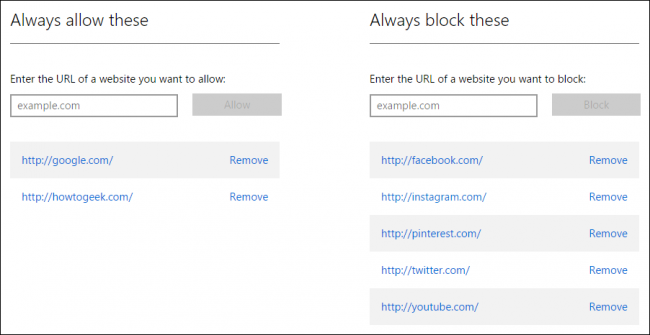 Here, you can explicitly allow and block websites. If you elected to “only see websites on the allowed list,” then this will be where you will add websites to the “Always allow these” list. The next category is to limit apps and games from three to twenty-year-olds, or not at all. Note, as you change the age, the ratings will change as well. 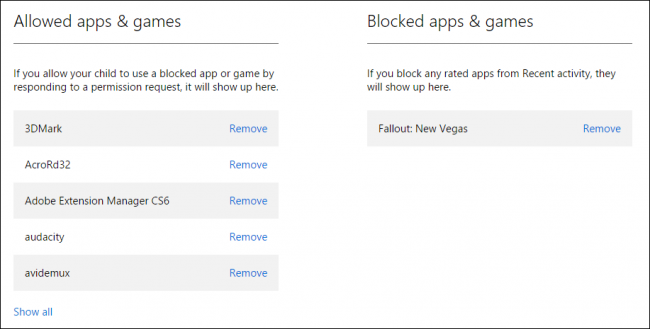 You can also explicitly allow or block apps and games, just as you would with websites. Finally, you can choose when your child uses the computer. You can decide how early and late they can use it, as well as how many hours per day. This means that even though your child may be able to use the computer throughout the entire day, you can still limit how many hours they’re allowed to use it. 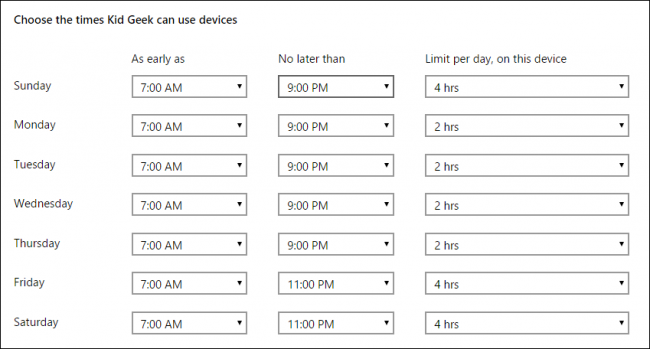 Microsoft has greatly simplified how parents can apply controls to their children’s accounts so if you’re new to all this, you should find it pretty easy to figure out. Having such controls in place should give you peace of mind to let your kids use the computer without too much adult supervision. 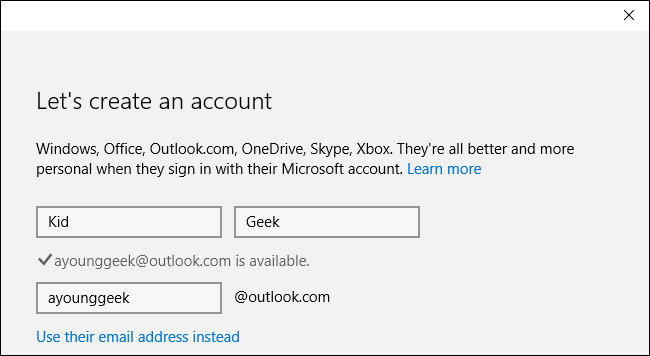 Keep in mind that if you add an existing account to your Windows installation, you won’t be able to monitor it until you verify it via email. Until you do that, your child can log into the computer and it will not be monitored by Family Safety.